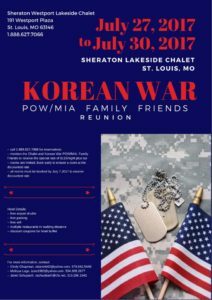 We will be meeting in St. Louis again for our reunion. Dates are July 27 – 30, 2017. The Korean War Ex-POW Association held its final reunion in 2014. The Hawaii mini-reunion in April, which is organized by Nick had its last reunion in 2009.